An anterior cervical discectomy and fusion is an anterior approach to removing a cervical herniated disc in order to relieve spinal cord or root pressure and alleviate corresponding pain, weakness, and numbness. An Anterior Cervical Discectomy, typically performed with a fusion and abbreviated as ACDF, is used to relieve the pain from a herniated disc in the upper (cervical) spine. This procedure involves your surgeon removing the damaged discs from your neck. A fusion surgery is usually performed at the same time as the discectomy, as it allows the area to be better stabilized after surgery. 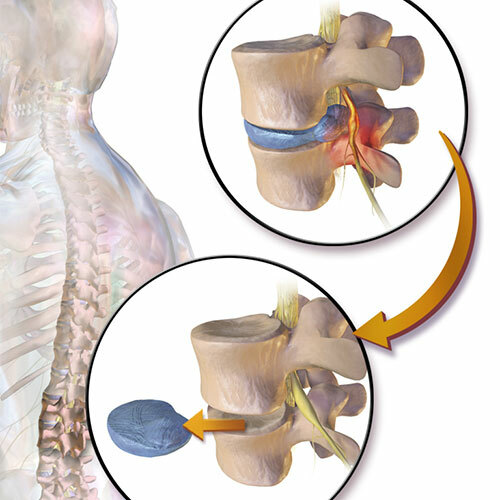 While an ACDF is commonly used for herniated discs, it can also be used to treat cervical degenerative disc disease, which is a condition that causes discs to dry out and shrink. Postoperative pain is decreased. Your surgeon will be able to access your spine through a fairly simple pathway. After the initial incision, there is just one muscle that must be cut in order to get to the spine. This allows for less pain afterwards, compared to a surgery done with a posterior (back of the neck) approach. It actually provides better access to the cervical spine. With this approach, your surgeon will be able to access discs from the top of your neck, all the way down to where the cervical spine meets the thoracic spine (mid-back). This approach allows for the surgery to be completed without disturbing the vital neck muscles, spinal cord, and spinal nerves. If you have had diagnostic tests confirming you have either degenerative disc disease or a herniated disc, and your pain has not been alleviated with medication or physical therapy, then you are a candidate for an Anterior Cervical Discectomy. Once your surgeon removes the damaged disc(s), a bone graft will be inserted to fill the empty space, connecting the vertebrae above and below it. After an ACDF, patients may be asked to stay overnight for observation, but can typically expect to go home the next day. However, the fusion will not fully set for a few months, so you should talk to your doctor about any activities you should refrain from while healing. Your doctor may recommend wearing a neck collar, especially while driving. Anterior Cervical Discectomy and Fusion procedures show promising results, with more than 75% of patients, who regularly underwent physical therapy after their surgery, reporting less pain. Most cases of cervical pain do not require surgery and are treated using non-surgical methods such as medications, physical therapy and/or bracing. However, if you have significant pain and weakness that does not improve, contact a surgeon at The Florida Spine Institute who will counsel you on whether or not surgery is necessary.